Rick has suggested we sing to attract the whales because whales also sing. It's not easy to carry a tune when you have a snorkel in your mouth, but I hum "Amazing Grace." "Remember, give'r till ya shiver," says the man responsible for my safety just before I jump off a boat into freezing water. I've come to the most easterly point in North America in the hope of having an up close and personal experience with whales. To call the water off Petty Harbor, Newfoundland, cold is an understatement. 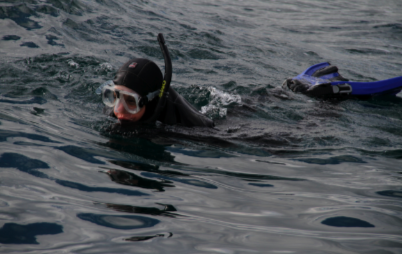 Even though the staff of Ocean Quest Adventures has outfitted me in a wetsuit, hood, gloves, booties and a snorkel mask that covers most of my face, I still feel the 42 degree chill as I hit enter the ocean. Each year, from June through August, 11,000 whales come here to feed on capelin, a forage fish from the smelt family and favorite of the leviathans. 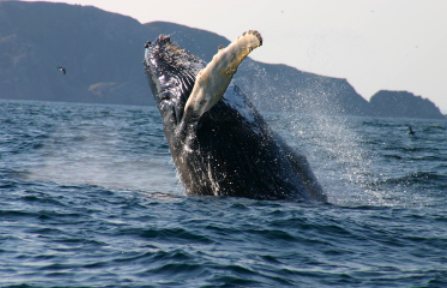 The humpbacks weigh from 25 to 30 tons, about 80,000 pounds. 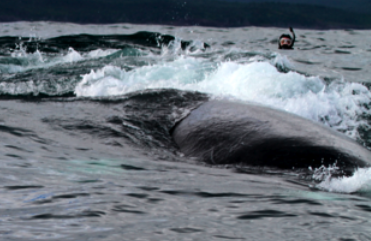 They're also one of the most aerobic whales and lack any fear around boats, so our chances of finding some are good. 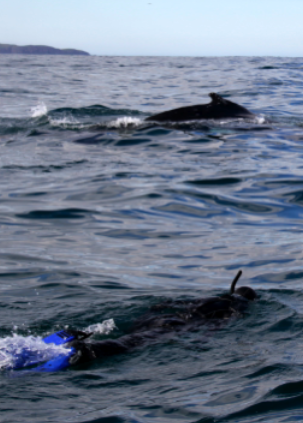 Even though Rick Stanley, the CEO of Ocean Quest and our leader and guide, has practically guaranteed it, I don't really believe I'll get lucky and see a whale. It's late afternoon and Rick has said that if we see a whale, we should just go after it. There are four of us in the water, and all of us happen to be women. This apparently, is a good thing because the whales seem to prefer women. Rick has suggested we sing to attract the whales because whales also sing. It's not easy to carry a tune when you have a snorkel in your mouth, but I hum "Amazing Grace." Nothing happens. I try humming "Rolling on the River," but no response. In the distance, some puffins awkwardly skim the water trying to fly. They look like cartoons. Suddenly I stop singing because even though I don't see anything, I smell something putrid and foul - whale breath! 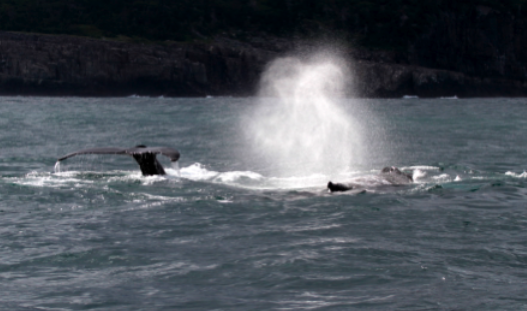 A second later, I hear a huge gasp and not twenty feet from me, two black humpbacks emerge snorting water into the air. My heart is somewhere inside my snorkel. I didn't expect this at all and I certainly didn't think it would be this close. "Swim towards them," calls Rick from the boat. I'm so surprised and frightened by the whales' bulk that I'm considering swimming back towards the boat when I see that the two whales are coming at me like a freight train. I am screaming at the top of my lungs. It's like having a semi come smack at you. But they don't surface. They dive beneath my legs and as I look through my mask, one of them flips over beneath me, so close I can see the white striations on his belly. And then they're gone. I look around. With a giant splash, one of them raises his fin and then disappears into the water. Now I realize that they are playing and they aren't about to kill me. I kick as fast as I can in their direction. It's hard to swim in the thick wetsuit. Once again, they're gone. And then, in the distance, the tail rises again, then disappears. I turn in circles looking. I hear a loud wheeze and then, not more than ten feet from me, an enormous black lump rises from the ocean. A Whale pops up ten feet away from the author. I swim in that direction, but he dives back under. I wait. He resurfaces, then disappears. And then he reappears so close I can see the barnacles on his fin. He seems to be waving goodbye. Finally, he's gone. He doesn't reappear, so we climb back into the boat, where we shriek like children. As the sun begins to set, Rick turns the boat towards shore and we motor for about a half an hour. Suddenly, ahead of us, a whale surfaces and blows, the vapor catching the light of the setting sun. The whale lets out a whistle, swings his fin into the air and gives us one last wave before disappearing, finally, into the icy deep.